Your name will begin its journey on a dime-sized microchip when the agency’s Orion spacecraft launches Dec. 4 on its first flight, designated Exploration Flight Test-1. After a 4.5 hour, two-orbit mission around Earth to test Orion’s systems, the spacecraft will travel back through the atmosphere at speeds approaching 20,000 mph and temperatures near 4,000 degrees Fahrenheit, before splashing down in the Pacific Ocean. But the journey for your name doesn’t end there. After returning to Earth, the names will fly on future NASA exploration flights and missions to Mars. With each flight, selected individuals will accrue more miles as members of a global space-faring society. "NASA is pushing the boundaries of exploration and working hard to send people to Mars in the future,” said Mark Geyer, Orion Program manager. "When we set foot on the Red Planet, we’ll be exploring for all of humanity. Flying these names will enable people to be part of our journey." The deadline for receiving a personal “boarding pass” on Orion’s test flight closes Friday Oct. 31. 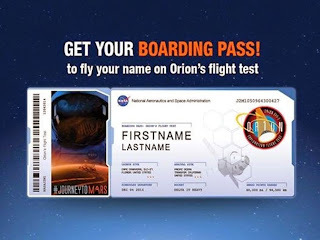 The public will have an opportunity to keep submitting names beyond Oct. 31 to be included on future test flights and future NASA missions to Mars. After registering your name you will get the following Boarding pass. Human brain is a miracle mixed with eccentricities.All these are products human-imagination.